Popular Buffalo deli to hold open interviews for growing business. Buffalo, NY – Joe’s Deli will be holding open interviews for a variety of available restaurant and deli positions. The deli company is looking to fill approximately 20-25 positions across four locations and its sister business, the Buffalo Catering Company. Positions include managers, cooks, dishwashers and prep cooks, as well as a Deli Supply Manager who will coordinate the purchasing, preparation and distribution for their food products across all Joe’s Deli locations. Joe’s Deli currently has two Buffalo locations, at 534 Elmwood Avenue and 1322 Hertel Avenue, and one in the suburbs, at the recently opened Northtown location at 714 Maple Road. A third city location, on the second floor of the Oishei Children’s Hospital at 818 Ellicott Street, is set to open in several weeks. There are available job openings at every Joe’s Deli location and the Buffalo Catering Company. 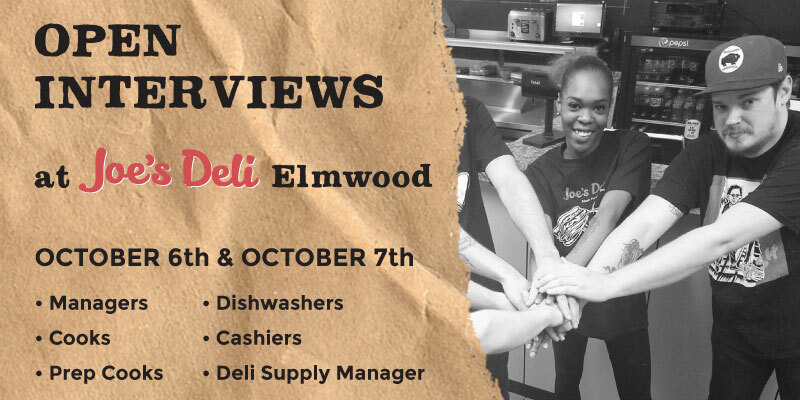 Interviews for all positions will be held at the at the 534 Elmwood Avenue location only. The drop-in interview sessions run Friday, October 6th from 9:00 am–11:00 am & 3:00 pm–5:00 pm and Saturday, October 7th from 11:00 am–1:00 pm. All interested applicants must bring a resume and a list of references. Joe’s Deli Elmwood Was Featured in a Buffalo Rising Article! The Buffalo Catering Company provides full-service custom catering for any corporate, individual, or university related event within Western NY.